God gave you a gift of 86,400 seconds today. Have you used one to say "thank you?" 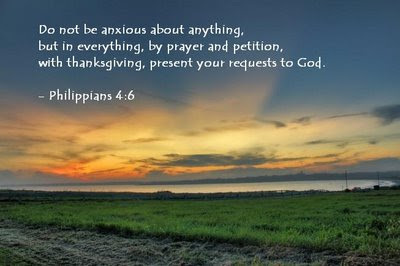 present your request to God. Years back, I used to have so many wishful thoughts! I wished I was somebody else...somewhere else...something else. It took several miracles and that one special moment in my life to realize how blessed I am. Now, with God's grace I wake up every day with a prayer of praise in my heart. Truly, there are so many reasons to be grateful for...and that an attitude of gratitude can certainly put meaning into one's life. Each day offers us an opportunity to learn that just as we are blessed when we give, so are we when we accept grace with a grateful heart. Be inspired with God's loving gifts, come join us at Word Filled Wednesday! each day is a blessing and should be viewed and lived like one. I was once given a project to list 5 things daily that I am grateful for. that was several years ago and I still do it. no matter how hard things seem sometimes, I can always be thankful and grateful for the blessings in my life. Thank you for this reminder - it is so easy to get caught up in our problems and have a pity party for ourselves. We choose to forget the goodness of God and the many blessings He has given to us. Until upon the street, I met a man who had no feet"
-quote from "how to stop worrying and start living"
I love that verse. Lovely post and have a blessed thanksgiving. Awesome post! We should always have thankful attitudes and remember to say the words, "Thank you" often! Especially to God. Have a wonderful Thanksgiving and a Happy WFW! Beautiful picture and testimony! That verse is one of my favorites. A beautiful reminder. Thank you so much. Wishing you and yours a happy Thanksgiving! Great verse and photo! Thanks for sharing. Such a wisdom in your quote & growth in your words! This verse & the beautiful graphic remind me how great God is and worthy of all our praise & thanks! Everyday is a time to give thanks! Thank you for blessing me and wishing me a blessed Thanksgiving...but since I'm not home in USA...no turkey for me! Such a lovely reminder dear. Such a pretty picture. And, I love Philippeans.